Significant highlights of my visit to MoMA were the connected exhibitions Print/Out and Printin’ that look at the way print is used in contemporary art. 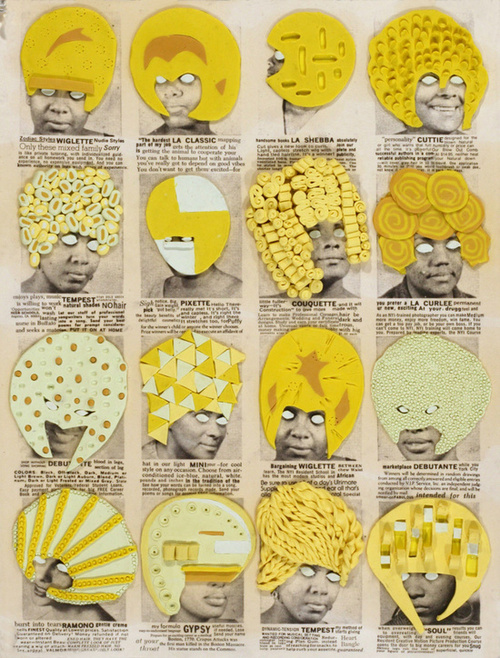 The latter, organised by artist Ellen Gallagher and Sarah Suzuki, Associate Curator in MoMa’s Department of Prints and Illustrated Books, is centred around Gallagher’s DeLuxe a grid of 60 frames each containing a collaged print based on adverts found in mid-twentieth century black lifestyle magazines and newspaper articles. DeLuxe is an extraordinary, fascinating work that demands, and rewards, close scrutiny. I am fascinated both by the adverts Gallgher has found and by her use materials – particularly plasticine – in the collages. 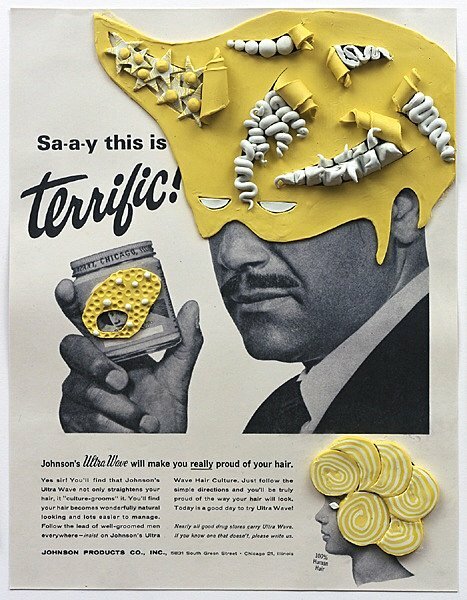 The use of yellow plasticine to provide hairstyles – of sorts – to make the models in the adverts proud of their hair is done with a lightness of touch but manages to make a serious point about the way in which black women were encouraged to see hairstyles they would struggle to reproduce – straight or loosely curled blonde hair, for instance – as aspirational. In Gallagher’s hands, these hairstyles take on a comic air often appearing more like a 1950s’ bathing cap than actual hair – inevitable perhaps given the use of plasticine, but also very effective – and the level of repetition gives the work a relentless hold on this viewer at least. The materials Gallagher employs are unexpected – and in introducing materials such as laser-cut plasticine was always going to give the work a slight air of the ridiculous even as it makes a serious political point – and I spend a lot of time looking at the finer detail of the works. Printin’ is a fascinating exhibition and a worthy partner for the excellent Print/Out which makes space for much larger scale works and in which, as a consequence, the boundaries between printmaking and sculpture become well and truly blurred. I find myself wishing for the chance of a second visit. Printin’ and Print/Out are at MoMA until 26 May 2012. Go if you possibly can. This entry was posted in Collage, Identity, Politics and tagged art, Collage, DeLuxe, Ellen Gallagher, MoMA, New York, Print/Out, Printin', printmaking by Ann Jones. Bookmark the permalink.